Paroo Shire, south-west Queensland, comprises an area of 47,647 sq km bisected southwards by the Warrego River. Its northern area was explored in 1846 by the New South Wales Surveyor-General, Thomas Mitchell, and in the following year Edmund Kennedy explored the lands adjoining the Warrego River. He reported on a fine waterhole on the river, which became the site of Cunnamulla (see separate entry). The shire was named after the Paroo River, a south-flowing stream west of Cunnamulla, and it is thought that the river's name derived from an Aboriginal word describing small fish. Pastoral settlement around Cunnamulla was patchy following Kennedy's expedition, as there was plenty of unoccupied land closer to Brisbane. 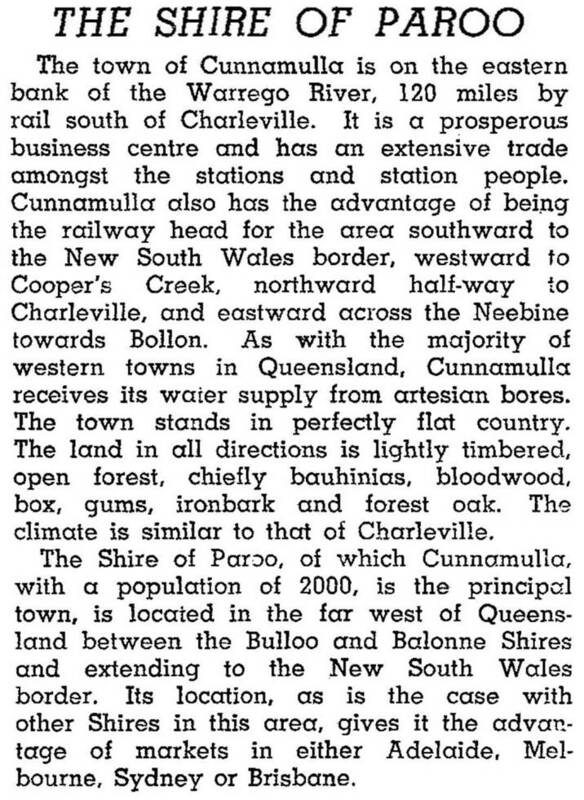 (Cunnamulla is 700 west of the coast). Nevertheless, Thomas Dangar took up a pastoral run east of the Warrego. It was after William Landsborough's expedition in 1862 that there was an inrush of pastoralists and entrepreneurs. Chief among them was James Tyson who began acquiring leaseholds in 1867. His Tinnenburra station, south of Cunnamulla, became the largest holding in Australia and its woolshed (1896) with 101 stands was the largest in the world. Tyson capitalised on the shire's artesian waters, sinking nine bores on his holdings. Paroo shire experienced high prosperity in the 1950s with good seasons and unprecedented wool prices. Its population peaked in the mid-1950s, but by the mid-1960s the prosperous times were beginning to fade and in 1973 the wool industry was forced into a reserve-price scheme. Sheep grazing remains the dominant industry, but beef cattle make a significant contribution. In 1993 there were nearly 650,000 sheep and 71,000 lambs in the shire, together with 41,500 beef cattle. Paroo shire is a lightly timbered plain, and its condition when first explored was influenced by Aboriginal fire-stick farming. Made ideal for grazing, the Paroo pastoral stations employed Aborigines as they were dispossessed of their lands. Tinnenburra had 500 people at one stage, but the breaking up of the large pastoral stations narrowed their employment opportunities. After decades of impoverishment, Aboriginal cooperatives were formed at Cunnamulla and Eulo. There are numerous scarred trees and stone arrangements throughout the shire, and the Australian heritage register records a camping, ceremonial and burial ground near Tinnenburra homestead. In 1996 the census recorded 529 Indigenous persons, 22% of the shire's population. In the 2011 census, 30.8% or 572 people were Aboriginal and Torres Strait Islander residents.